Mark’s story of the healing of two females in today’s Gospel might be my favorite of all the miracle stories. It’s so packed with “Aha Moments” that I hardly know where to begin. At the beginning of the story Mark says that Jesus’ original plan is to “stay by the sea” with his disciples. 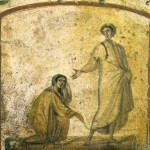 But Jairus appears and begs him to come to his house because his twelve-year-old daughter is “at the point of death”. And so his plans change on a dime. He leaves immediately in a new direction. And who should be living in that new direction? A woman who has had a “chronic flow of blood” for twelve (!) years. Look at the beautiful connection here. For the twelve years that Jairus’ daughter has been alive this woman has been bleeding. And what is perhaps the cause of the illness of the twelve-year-old girl? Might she be beginning her own menstrual period and having extreme pain or even unconsciousness? 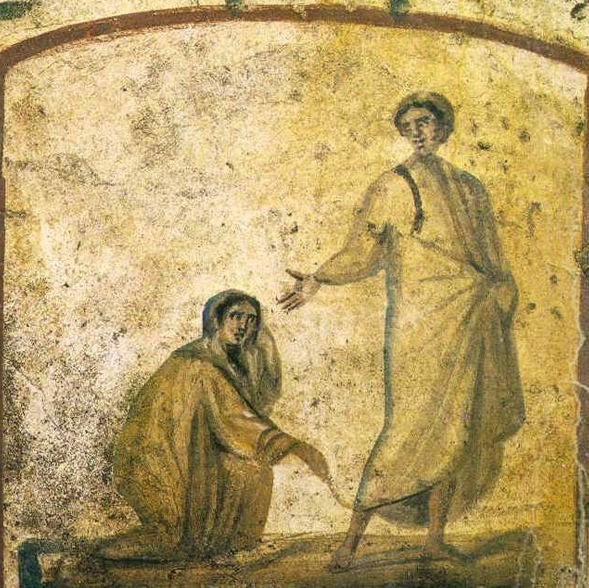 This older woman and this young girl, unknown to each other before this day, are mystically connected, and if Jesus hadn’t “changed his plans”—ha!—and gone in a different direction in order to heal the young girl then—yes! −− the older woman may never have had the opportunity to touch him and be healed. We’re all connected. On his way to the little girl the older woman is healed. And that woman knows that this is her moment, her divine appointment, and she reaches out with all her might. Watch out for changes in plans. Jesus might just be coming your way. Have you ever had a surprise encounter with Christ?